I always find any postcard printed during the Golden Age of postcard production in France in the early decades of the last century absolutely irresistible! 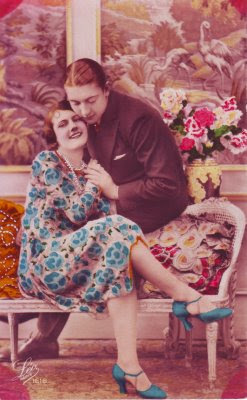 This hand-tinted real photograph postcard issued by French printers Suzy is in superb condition. 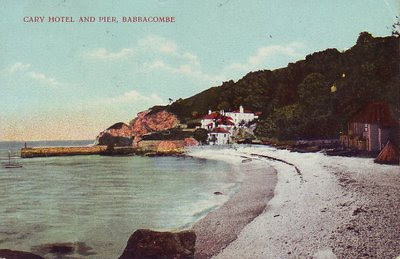 Compared to some of the more garish colours that came out of the studios of the numerous Parisian postcard publishers right through the 1920s this is a rather tasteful affair with its subtler washes, although the crimson used on the patterned tops, sock trimmings and flowers is a dazzling hint of what those hand-colourist would be capable of in the future! 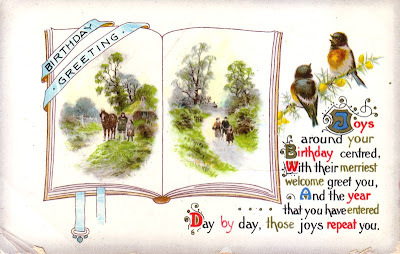 This gorgeous winter scene with its Happy New Year message is my Christmas postcard to you all for this year. 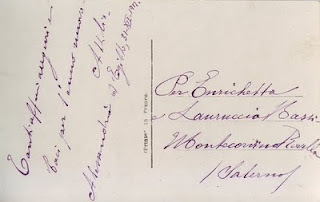 The postcard was issued by Paul Trabert of Leipzig (shown here by the initials P.T.L) who was operational from 1901 until at least the late 1960s. 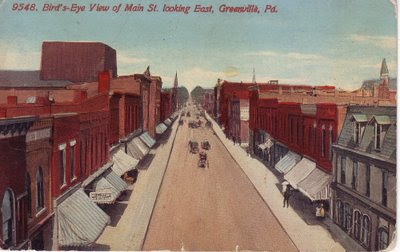 He set up his family-run business with its own publishing department Art de Vienne and was also a contract collotype printer for other firms until end of the First World War. 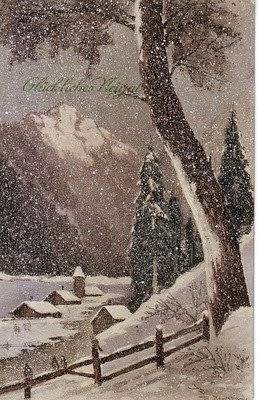 This postcard would also appear to be a collotype or some other kind of high quality printing technique, whilst the snow flurries seems to have been finished by hand as the matte surface is slightly raised on the snow flakes. The card is artist signed but the signature isn't clear. 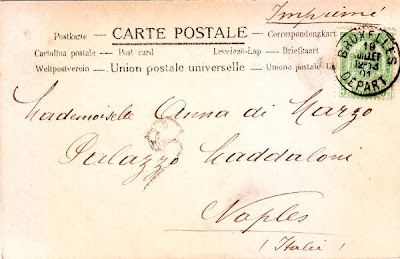 It was posted to "Volosca" (or rather "Volosko" – the spelling of the address is Italian on the card, as is the message) which is now found in modern day Croatia, although when this card was posted it would have been part of the district of Istria in the Austrian Littoral. 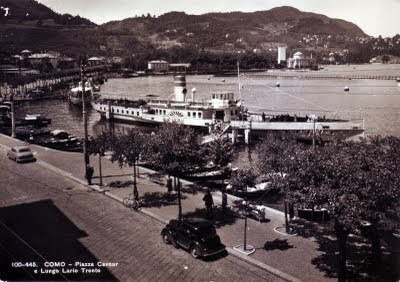 This popular resort on the Austrian Riviera was a crown land (Kronland) within the Austrian Empire from 1813 till 1867 and subsequently part of the Austro-Hungarian Empire or Dual Monarchy from 1867 to 1918. 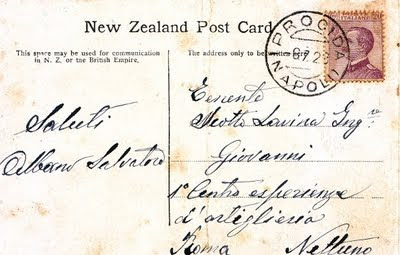 The area has always been linguistically and ethnically very mixed with Italians, Slovenes, Croats, Germans, Furlans, and Istriots being the main ethnic groups - its history is a long and complicated one and this postcard is evidence of this! There isn't much left of the postage stamp, but we can just about make out the beginning of “Magyar Kir Posta” (meaning "Hungarian Royal Postage"), and with the currency “Filler” and the value of 5 overprinted in black we have just enough information to identify the stamp as an Hungarian postage stamp issued in 1900 which featured the Turul, the mythical bird of the Magyars (not visible) flying over the royal Hungarian crown (visible). 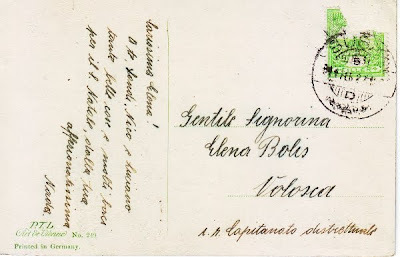 This postcard must have been posted from neighbouring Kingdom of Hungary, therefore, as the Austro-Hungarian issues I believe, were issued in Heller currency. 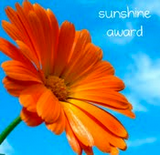 This is a thorny area, however, so please do correct me below in the comments if anybody knows better! Happy PFF and of course, Merry Christmas! It's not often that I happen upon vintage Japanese postcards here in Italy so I my eyes were quickly drawn to this uncirculated 1950s postcard when I saw it the other day on a market stall. 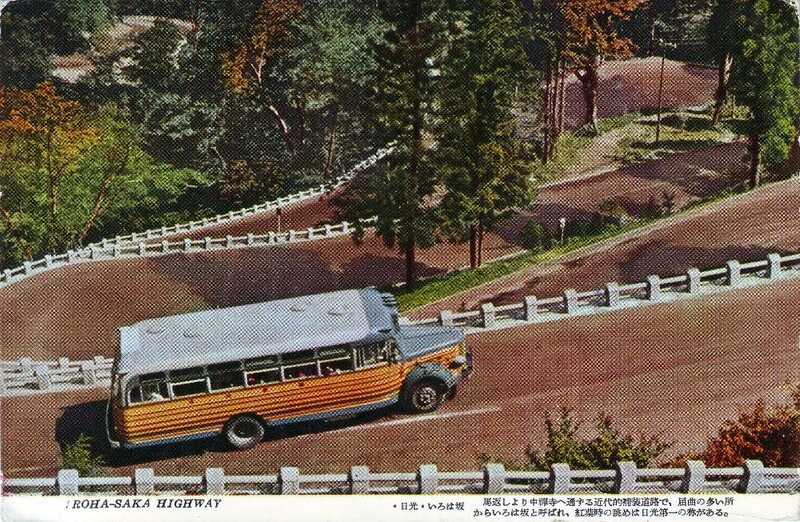 There are no indications as to the postcard publisher or the date of issue, but from the style of the bus winding its way up the Iroha Slope to Nikko I'm guessing it's a mid 1950s to early 1960s card at the latest. 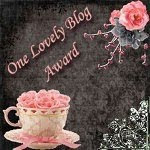 As luck would have it I have an email friend - Gaye Rowley - who lives in Japan and is an expert on all things Japanese. 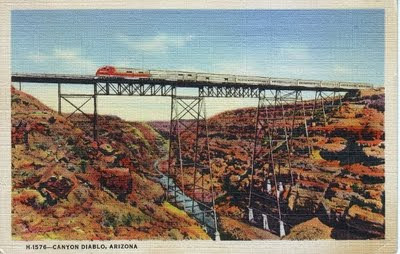 She explained a little more about the name of the road - I-ro-ha are the first three letters of the Japanese syllabary, so the name of the highway would be like the "A-B-C Slope" in English. It is so called because there are as many twists and turns in the road as there are letters in the syllabary! 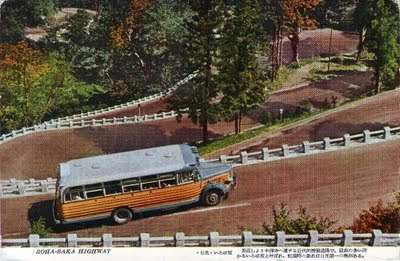 From Umakaeshi (meaning "the place on a mountainside where the horse can no longer carry you and you have to dismount") up to Chuzenji (a famous temple), there is a modern sealed road called "Iroha Slope" because of its twists and turns. During the maple-viewing season, it provides the best views in Nikko. 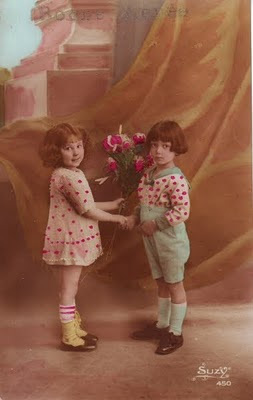 This lovely uncirculated vintage movie star postcard features a heavily disguised Shirley Temple in a scene from the 1935 Fox musical Curly Top. Directed by Irving Cummings, this film was another hit movie starring the then seven year old Hollywood star and was a Shirley Temple vehicle all the way. 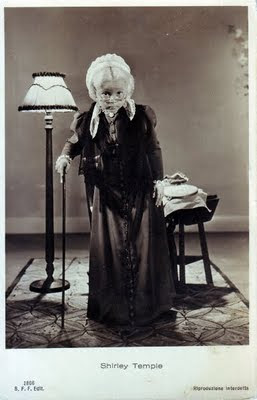 This particular scene is the moment in which she sings When I Grow Up (lyrics by Edward Heymand and music by Ray Henderson) dressed as an elderly woman who suddenly gets up and tap dances at the end of the number! The song itself also went on to become a hit of the day and sold thousands of sheet music copies. But I haven't quite made up my mind, it's much too far away. She looks so nice and comfy in her rocking chair 'n' all. I like her long and funny dress, I like her hair, don't you? But it must be fun to have nothing to do but rock, and rock, and rock. 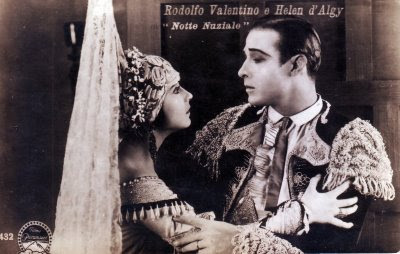 This Italian postcard was printed by the Florence postcard company Ballerini & Frattini (1912 - the present day) and issued in 1936 a year after the film's original US release. 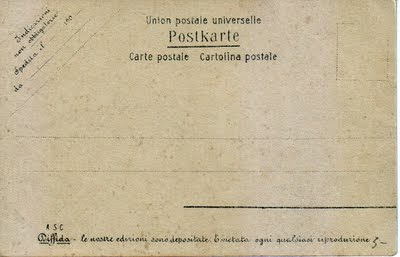 As an interesting footnote, the date on the back of the card is "Anno XIV" rather than the more conventional "1936", a reminder that this card was issued during Italy's darkest period - that of Italian Fascism. 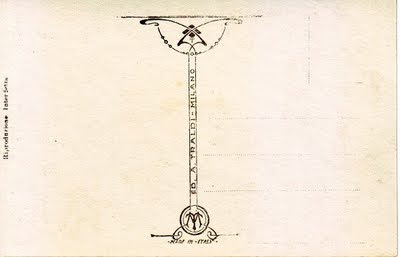 There was a serious attempt to displace the Anno Domini system in those years by using Roman numerals to denote the number of years since the establishment of the Fascist government in 1922. Therefore, in this case, 1936 was year XIV. Click here to watch a video clip of Curly Top. 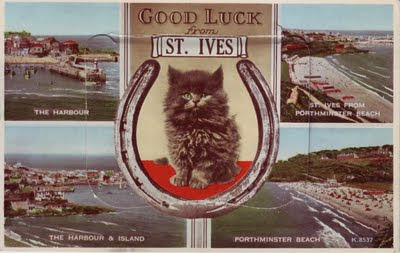 Her appearance dressed as she appears in this postcard is at approximately 3.08 minutes. 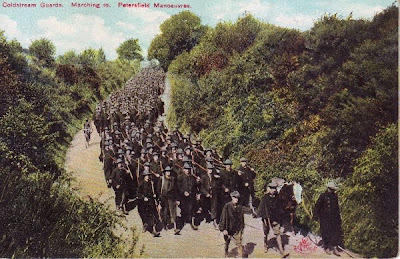 Lest we forget...Today, 11th November, is Armistice Day so I thought this image of the marching Coldstream Guards on their way to Petersfield Manoeuvres would be a timely addition to the blog. Her Majesty's Coldstream Regiment of Foot Guards is actually the oldest regiment in the British Regular Army which has seen continuous active service since its founding in 1650 by General George Monck at Coldstream in Scotland. Whilst not so instantly identifiable in this image, they are known the world over by being one of the Queen's five foot guard regiments that wear the striking red uniforms and distinctive bearskin hats - they've surely been photographed whilst standing sentry by every tourist who ever visited London! This uncirculated postcard was published by Max Ettlinger & Co. Ltd. as part of Series 4841 which appears to have been dedicated to the Coldstream Guards and was issued under the Royal Series name. 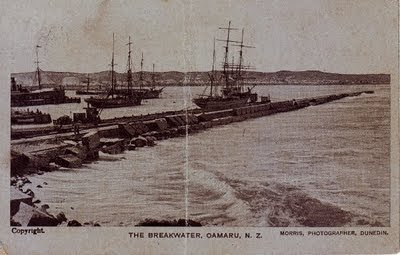 They published many real photograph hand coloured postcards, but this particular example looks to be a printed card, although without the use of a magnifying glass the effect looks very much like a hand-tinted example. 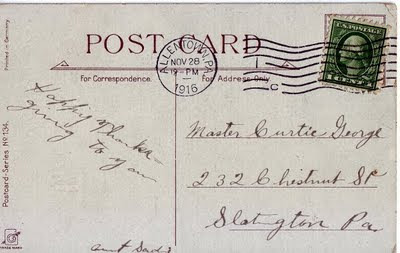 Certainly the title of the scene and the company logo in red on the front of the card were hand stamped. 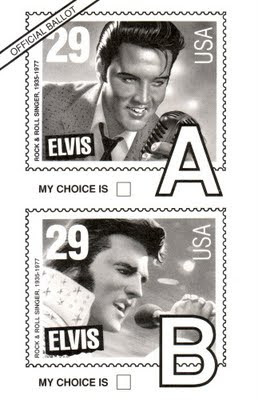 There is also a slightly textured surface over the card - a barely perceptible stippled effect. 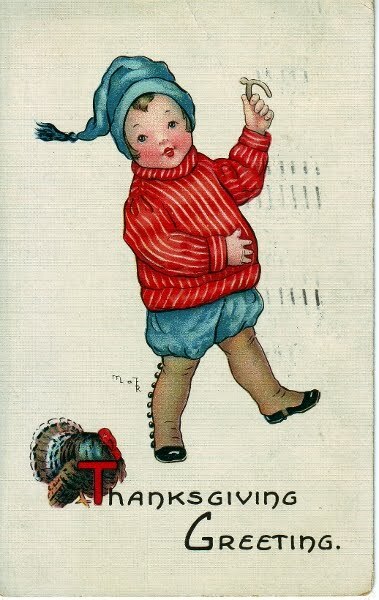 Like most of their postcards, this was printed in Germany and is a perfect example from the so-called Golden Age of postcard production. The First World War would effectively bring that period to an end and Max Ettlinger & Co. Ltd. would close shop in 1916. 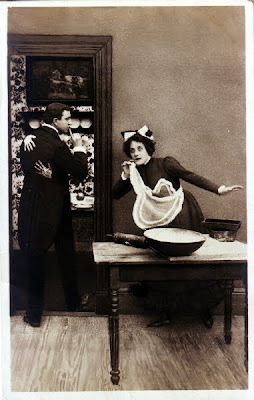 Portrait postcards of opera stars were extremely popular in the early 1900s and although many of the names will only be familiar to opera-buffs nowadays, they are still charming indicators of how fashions change and provide an important historic and cultural record. 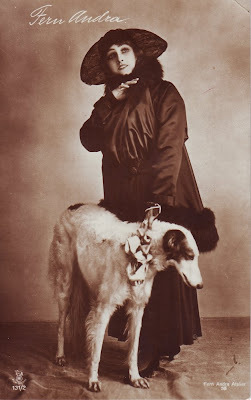 This undivided back Belgian postcard was published by Paris and Brussels-based printers Vanderauwera & Cie (who also appear to have published pamphlets) and features the French operatic soprano Alba Chrétien-Vaguet in a portrait by Dupont. 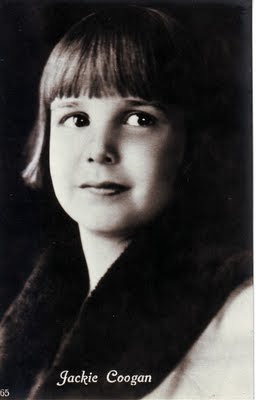 The young Alba first studied the piano at the Paris Conservatoire and began her operatic career at the historic Belgian opera house La Monnaie in Brussels in 1891. This card, in fact, shows her in the role of Charlotte in Werther, which ran for 20 performances over the 1892-1893 season at La Monnaie, and identifies her by her maiden name Mme. 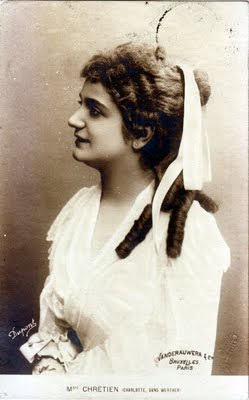 Chrétien - she would marry Albert Vaguet, a tenor of the Opéra de Paris, the following year in 1894. 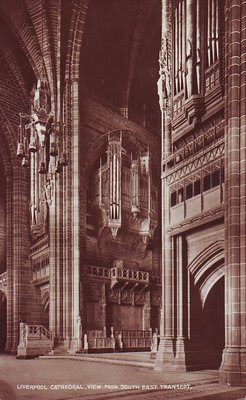 The card has a matte rather than glossy finish and is probably a collotype print from a monochrome photograph. 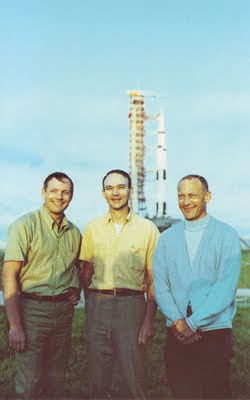 The original photograph bore an embossed logo for Dupont which is just visible to the right of the printer's credit in the bottom right hand corner of the image. 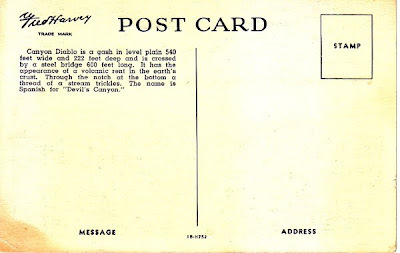 Interestingly, the card was not actually posted until 1901 and being an undivided back card contains no message, just the address. Whilst I've been unable to uncover anything about the recipient, a certain Anna di Marzo, the address does excite some curiosity - Palazzo Maddaloni, in full Palazzo Carafa di Maddaloni, is a well known historic Baroque palace in Naples, which after having faced the threat of demolition for years, has finally been restored. This very fine portrait of a Kikuyu traditional doctor in Kenya, East Africa - a "Kikuyu Witch", as he is described here - was taken by S. Skulina, a commercial photographer working in Kenya during the 1950s. 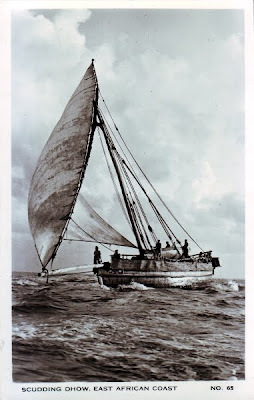 The real photo postcard was issued by Pegas Studio, Nairobi as part of the series "Africa in Pictures" and is in almost mint, uncirculated condition. 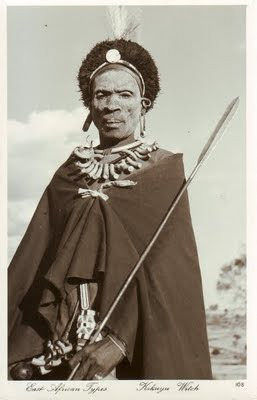 The role of witch doctor was one of great importance in the administration of Kikuyu clans and he was one of the key figures in the council of elders. The Kikuyu still remain the largest ethnic group in Kenya to this day.